Alice joined the practice in April 2014 after being made redundant from a 9 year position at the Wingecarribee Animal Shelter. 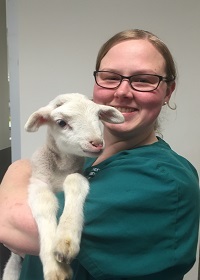 She successfully completed Certificate II in animal studies in 2008 and her continued passion for animal welfare has led her completing her Certificate IV in Veterinary Nursing. When not at work, Alice enjoys renovating her weatherboard cottage and spending time with her menagerie of pets including a greyhound named ‘Connor’, ‘Mabel’ the moggie, ‘Rex’ the spotted python and a pair of Spinifex hopping mice and ducks!